8 dag of white flour, 6 dag of sugar and 3 eggs. 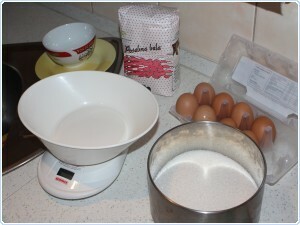 Put sugar, flour and 2 eggs into a bowl. As for the 3rd egg, separate yolk and egg white. 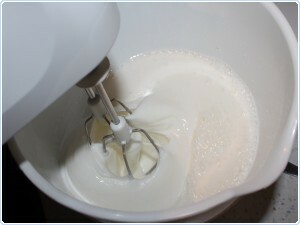 Put the egg white into the bowl with the rest of the ingredients. You can put the yolk away and use it for some other dish so it doesn't go to waste. 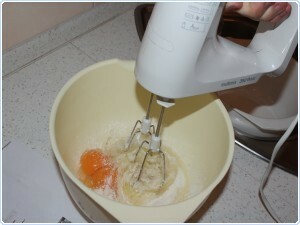 Mix the ingredients using a mixer. 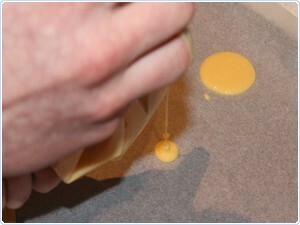 Now pour the mix onto a baking tray covered with baking paper. Pour it like you would make cookies. You can use a spoon or a plastic bag with a hole in a bottom corner. Pre-heat the oven to 200°C (392°F). 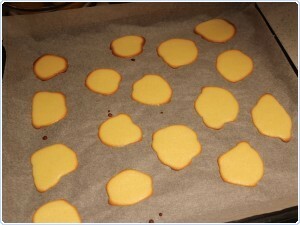 Put tray into an oven, and bake them for about 10 mins or until they turn golden brown (see picture). 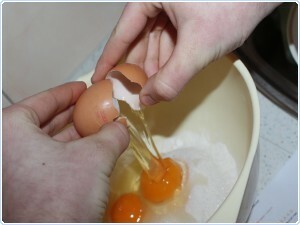 Again separate yolk and egg white of the 5 remaining eggs. Put the egg white into a bowl and add 25 dag of sugar. 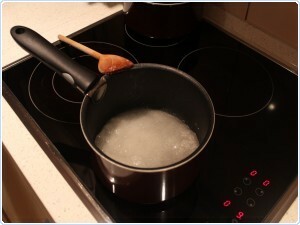 Put 18 dag of sugar into 4 spoons of water and cook it until it gets thicker. Stir it all the way through. 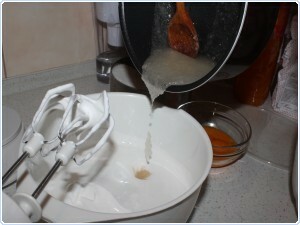 Add the melted sugar to egg white cream and stir everything together. 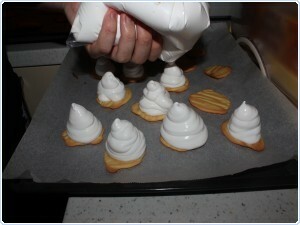 Put the cream onto to the cookies. You can use a bag again. Put cookies with cream in fridge and let's proceed with melting chocolate. I advise you to use a quality dark chocolate. If you don't like a taste of dark chocolate you can use a regular milk chocolate. 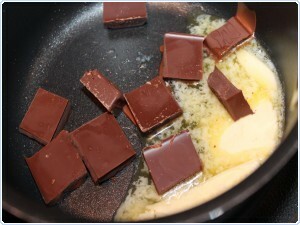 Put 140g of chocolate and about 100g of butter into a smaller pan and put it on a cooker with a low to medium heat set. Stir and melt the chocolate until it turns silky smooth and running. 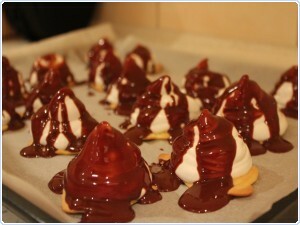 Pour the melted chocolate over the little marshmallows and let them chill in the fridge for about 15 mins. Serve them nicely and start eating. 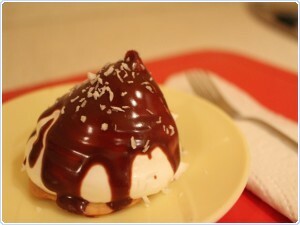 You will love this delicious, fresh and easy to make dessert. Strawberries, mascarpone, whipped cream and tasty Greek yogurt with a hint of lime is a combination you really need to experience. Chocolate cake has to be one of the most popular cakes on the planet. This delicious desert is easier to make as you might think. Simple, delicious and all around useful dish item that can be used as a sweet desert with jam, Nutella, peanut butter, you can use them to wrap veggies or meat in them or even put the pancake stripes in a soup instead of noddles.